Bring on (a taste) of Spring! A warm front is pushing through the Finger Lakes this morning and will result in temperatures pushing into the 60s Thursday and Friday. A warm front is pushing through the Finger Lakes this morning, finally ushering in a long awaited taste of spring. 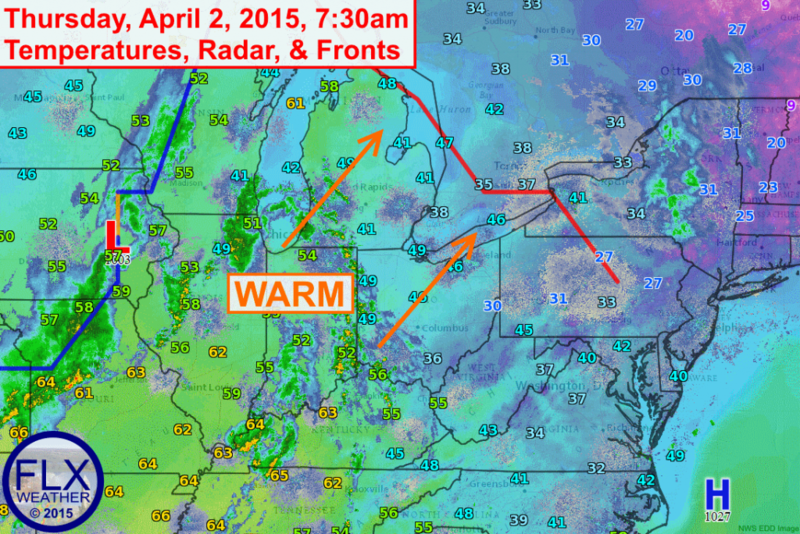 As low pressure over the Midwest tracks northeast, warm air will push into our region today. Clouds early this morning along the warm front will give way to sunshine for most of the morning and early afternoon hours. Temperatures will quickly rise through the 40s and 50s, with many locations pushing into the 60s by this afternoon. Some showers will be possible later in the afternoon and into the evening and overnight hours. A few rumbles of thunder cannot be ruled out as well. Temperatures tonight will be mostly in the mid and upper 40s. For the most part, Friday looks fairly dry as we settle between systems. A few scattered showers may still be possible, but there will be a better chance for rain overnight. Temperatures will again push towards 60º for most of the Finger Lakes. Heavier precipitation will move in Friday night as a potent area of low pressure tracks from the Ohio Valley towards New England. Most of this precipitation will be rain, with some areas picking up an inch or more. Some localized minor flooding problems could result. Cold air will get sucked into the storm in the predawn hours on Saturday, changing precipitation over to….well…let’s just enjoy the warm air for now and worry about the weekend tomorrow.